A year ago, my blogger friend, Swathi Iyer of Zesty South Indian Kitchen, invited me to be a part of Baking Partners, a baking group which aims to give home bakers like me the chance to learn the techniques in making perfectly baked homemade goodies. I've always wanted to improve my baking skills so I said yes without second thoughts. After 11 challenges, (should be 12 but I wasn't able to join last month's challenge) I can proudly say that baking does not intimidate me anymore. I am confident with my baking skills now more than I've ever been before I joined Baking Partners, and for that, I am truly grateful! To Swathi and the rest of my friends at Baking Partners, thank you so much...I'm am happy to be part of this group and I want to wish you all a Happy Anniversary! I strongly recommend that you try this cake. For those who loves Sansrival, I'm sure you'll love this too! It has a melt-in-your-mouth goodness that you just can't resist! 1. Remove paper label of condensed milk cans then put the cans in a medium saucepan. Add enough water to cover the cans completely. Bring to a boil, then simmer over medium heat for 2 hours, adding more hot water to cover the cans as necessary. 2. Remove from heat. Let the cans sit in the water for about 5 minutes, then drain the water and set the cans aside. DO NOT OPEN THE CAN AT THIS POINT, or they will explode. Allow the cans to cool to room temperature, then open them with a can opener. 3. Put the butter in a mixing bowl. With a mixer, beat until the butter is fluffy, about 5 minutes. 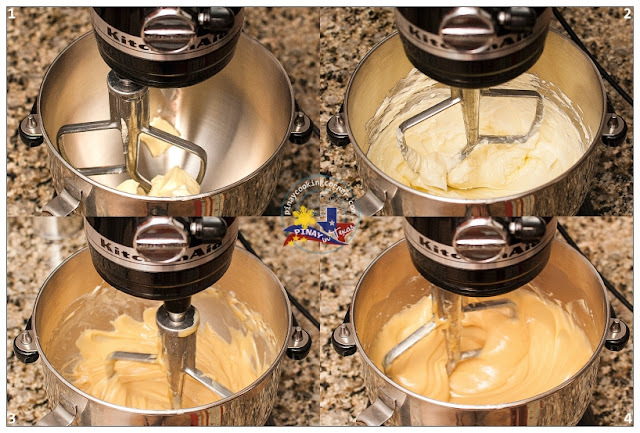 Continue to beat, gradually adding 1 1/2 can condensed milk and beat until you obtain a smooth cream. Do not overbeat or the cream will curdle. Place the cream in the refrigerator while you prepare the dough. 1. You will need a double boiler to prepare the dough. 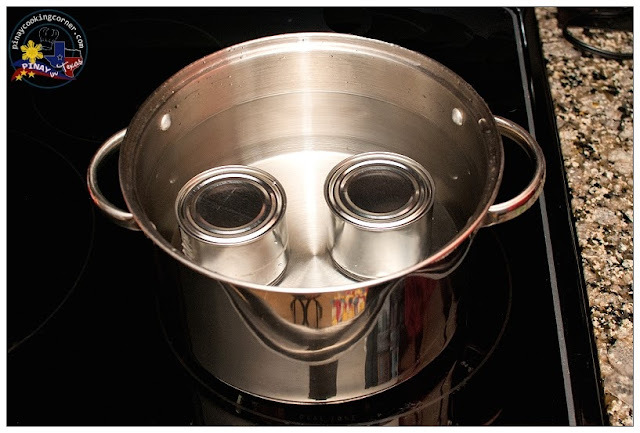 If you don’t have one, use two regular saucepans or a saucepan and a heat-proof mixing bowl. 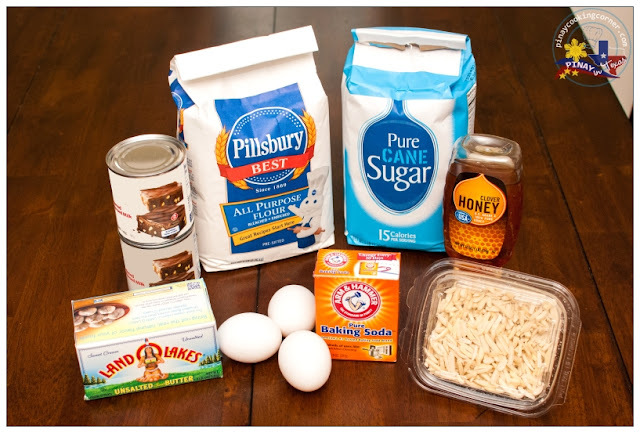 Put the eggs and sugar in a heat-proof mixing bowl (or the top of a double boiler). Stir to mix. Add the honey and butter. 2. Fill a medium saucepan with water and bring it to a boil. Place the mixing bowl on the saucepan. Remember - the bowl should not touch the water in the pan, so adjust the amount of water accordingly. Maintaining a gentle boil, cook the mixture, stirring constantly with a spoon or a balloon whisk, until the ingredients are well blended and the mixture is smooth, about 5 minutes. 3. Add the baking soda, and cook, stirring constantly, for another half a minute. The mixture will somewhat whiten and increase in bulk. Remove the bowl from the saucepan. 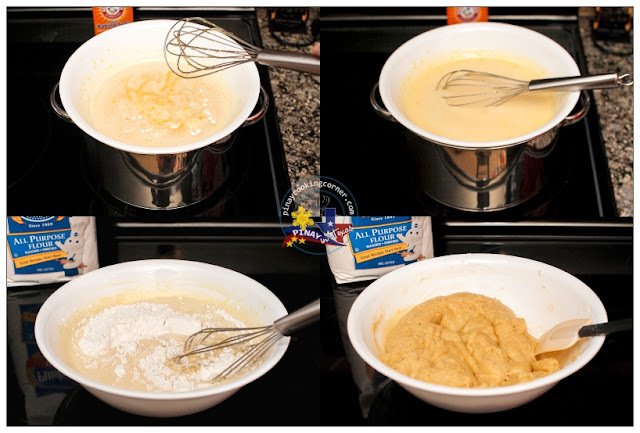 Gradually add 3 cups of the flour to the mixture, mixing with a spoon with each addition, until you obtain a dough that is somewhat sticky and has consistency of play dough. Do not be tempted to add more flour as the dough will harden as it cools off. If it is still too sticky, add the rest of the flour. Otherwise leave it at 3 cups. Divide the dough into 5 parts and shape each part into a ball. 4. Preheat the oven to 375F. Line a baking sheet with parchment paper. Take one dough ball and put it in the middle of your lined baking sheet. With your fingers, press onto the dough and flatten it into a thin 10-inch circle. If the dough sticks to your hands, dip your fingers in flour before pressing onto the dough. It's ok for some parts of the flattened dough to appear somewhat transparent. But be sure not to tear it and patch with a piece of dough if you do. NOTE: You can shape your cake as a rectangle or square, if you want to. 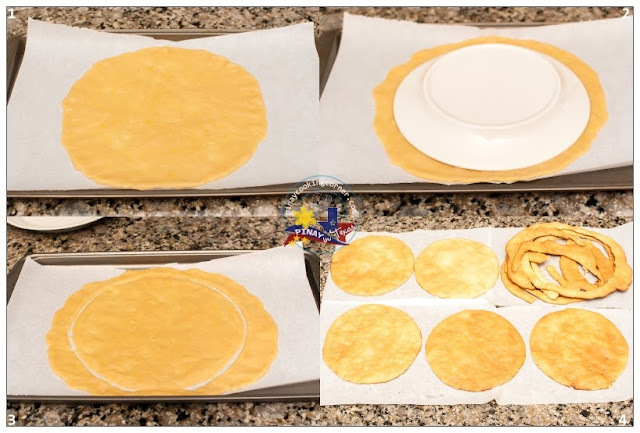 5.Since you will need some crumbs for the top and the sides of the cake, you do not have to worry about the irregularities around the edges of the circle - you will cut them off to obtain a perfect circle. Once you’ve flattened the dough, put a 9-inch plate on top of it and using a sharp knife, trim off excess dough around the plate. Do not remove the trim-offs from the baking sheet. Let them sit there. Once the biscuit is baked, you can easily peel them off. 6. Bake each biscuit layer on the middle rack of the oven for 4-5 minutes, until it is light golden on top. The dough will slightly puff up, but don’t expect it to rise as a sponge cake. Do not overbake. Remove from the oven, gently run a spatula underneath the biscuit to loosen it, then remove from the baking sheet. 1. Spread a generous amount of cream onto one biscuit, then top with another. Continue in this manner - stacking the layers on top of one another and spreading some cream in-between. Slather some cream on top and around the cake as well. 2. Finely grind the baked trim-offs. 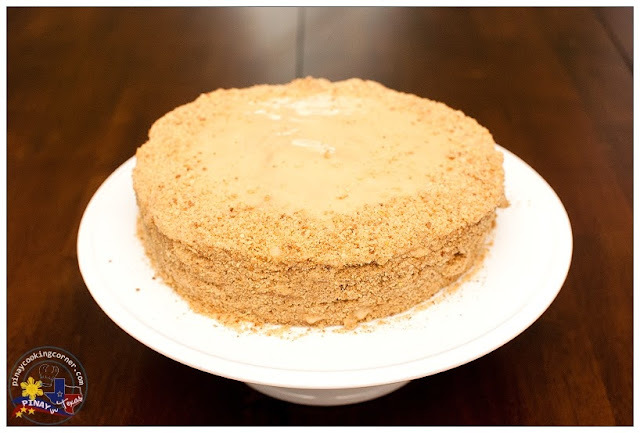 Sprinkle the crumbs generously on top of the cake and lightly press some around it. If you do not have enough crumbs, grind some walnuts and mix with the crumbs. Decorate as desired. 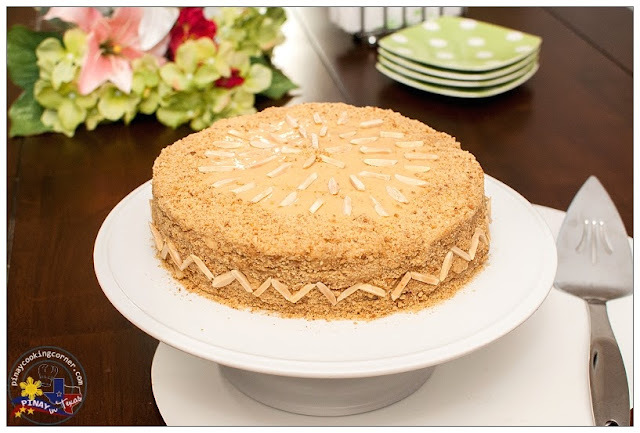 I used slivered almonds to decorate the side and top of the cake. At this point, the cake will be hard. 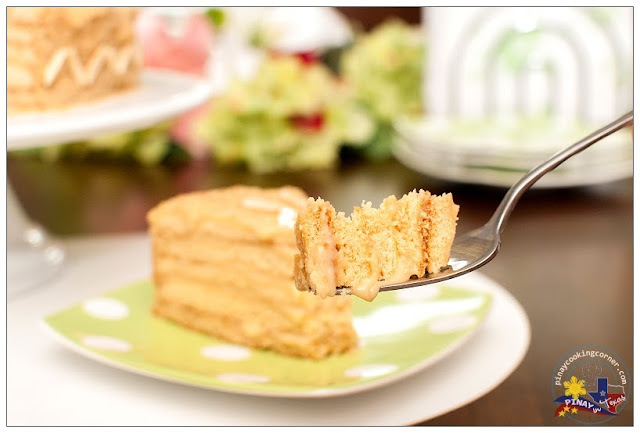 Leave the cake aside to soften at room temperature for 6 hours or overnight. The biscuits will have absorbed the cream and the cake will be soft and ready to melt in your mouth. 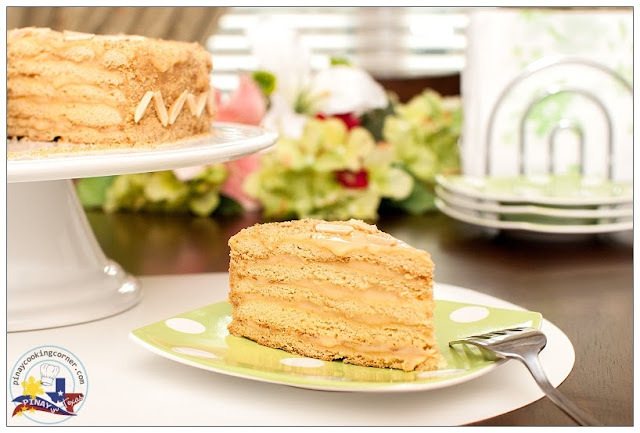 Check out what other Baking Partners members have shared this month! Wow, it looks so darn perfect! I love the dulce de leche filling in it. It's got to be a perfect pair! 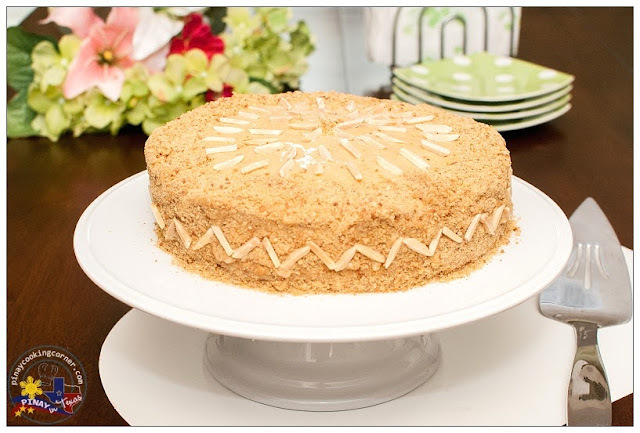 Wow looks great Tina,gorgeous cake and perfect slice,love it..it is definitely and irresistible cake. Awesome looking cake Tina! Love love the pictures and the pictorials are really helpful! Perfect layers, you are motivating me to try this seemingly 'hard work' recipe. Well done! Made with perfection as always. Lovely cake, so well done. Cannot beleive Baking Partners is 1 year, Happy 1st Birthday Wishes Baking Partners, you guys are awsesome!! Looks wonderful yaar, lots of hardwork though! Thanks Tina for dropping by and leaving a comment. Your Russian cake looks fantastic. I wish to bake it too. Delicioso cake gran trabajo felicitaciones,abrazos. hi Tina i love your version. I can't wait to try it myself. Thank you sooo much for sharing all your recipes. I've learned a lot. And i can say it also increase my sales. God bless u more and your family.